The Chief was due to leave Los Angeles at 6pm, and I hoped for plenty of gorgeous sunset views as we sped through the Southern California desert towards Arizona. The scenery didn’t disappoint, and a crescent moon also adorned the sky later in the evening, though my ability to adequately capture it through the windows of a reasonably speedy train was somewhat limited. After about four hours into the journey, with the very last of light fading rapidly, the train slowed to a halt and sat in the same spot for what seemed like ages. I watched the lights of a freight train go past on a nearby rail and just assumed we were waiting for it to pass, but the Chief did not move on even ten minutes after the other train had gone. Half an hour later, the driver made an announcement – the train’s engine had lost power and they needed to send another one so that the Chief could continue its journey. We waited nearly three hours for the replacement locomotive. 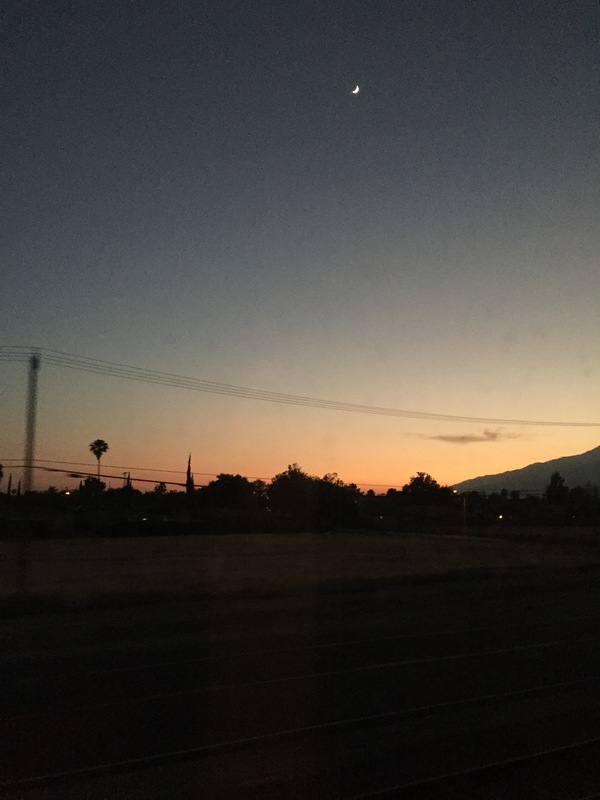 Thank goodness we had broken down in the middle of the California desert at night – there was no longer air-conditioning in the train and Amtrak may well have had a few faintings on its hands if we’d been trapped inside a metal box in 40 centigrade heat for several hours. As the train finally moved on, sleep arrived and the next thing I knew, the sun was rising and we were deep into Arizona. The landscape of Arizona and New Mexico was vast, arid and mostly uninhabited. There were a few small buildings and settlements here and there, but they really were incredibly isolated, probably a good 3-4 hours drive from a town or place with supplies (not counting gas stations.) Thinking of the reputation of the American Wild West, I started to have all manner of dark thoughts, mainly, ‘this would be a great place to hide a dead body – I bet there are loads of old cowboys buried out here.’ It turns out I’m not the only person to have had these thoughts – a Twitter friend who has also travelled on the Chief wrote about his experience here. Note similar dead body ponderings. How many dead bodies are buried out there? Wasn’t this a scene from Seven? The train arrived into my next stop, Albuquerque over three hours late. But I was in time for happy hour at my hotel, which more than made up for the delay. One other interesting thing to note about my lodgings was that it was a former psychiatric hospital, converted into a luxury place to stay. As a scientist I don’t believe in ghosts or the supernatural, but it did seem like there was an ‘atmosphere’ in the neutral-toned corridors and rooms. Or maybe it was just the air conditioning working overtime to keep the desert heat at bay. When I resumed my journey on the Chief four days later, it was scorching hot and I was hoping there would be no recurrence of the breakdown from the previous journey. Thankfully there wasn’t, but remember when I said at the start that this was the most dramatic journey? The Chief travels across Kansas, one of the most storm and tornado-prone regions of the US. If you’ve read my earlier train posts, you’ll know I’d already seen plenty of severe weather in several states – more than I’ve ever experienced in the UK. It certainly made me sit upright in my seat and I watched it very closely until it seemed obvious that it probably wasn’t a tornado but most likely a tail cloud. As the train continued on its way, that particular thunderstorm passed but several more took its place in the sky. I don’t think I’ve ever been on a train journey where I could see several thunderstorms from both sides of the carriage, all raging and lighting up the entire sky like an alien invasion. As night fell, the sky darkened to pitch black but still the storms raged on for a good three or four hours, making the journey a visual spectacular. I got two shots at one of the stations (I think it was Hutchinson, Kansas) of the night sky before and after lightning. After what seemed like an eternity of watching the storms rage outside the train, I fell asleep and eventually woke up hurtling back to Chicago across the plains. I think the Southwest Chief was my second favourite train journey – even with the first breakdown. It’s also the route on which you can stop off to see the Grand Canyon, if you so wish to do that. I think that’s on the list for the next time I take the Amtrak. This entry was posted in Travel and tagged America, Amtrak, Rail Travel, Railroad, Southwest Chief, Travel, USA. Bookmark the permalink.